This is one of those joyous films that can be received and enjoyed at face value or used as a springboard to do some deeper thinking and reflecting on bigger questions. Which way did you choose to see it? One of the top films of 2016 it was nominated for 8 Academy Awards but strange things were happening that year at the Oscars and it only won 1! Amy Adams should have won best actress with a strong yet subtle and nuanced performance as academic linguist Louise Banks. The film is about the arrival of some extra-terrestrial beings who arrive in 8 spacecraft at different locations around the world. At face value the film depicts a race between the nations competing to be the first to decipher the alien's intent whilst keeping a finger on the trigger just in case they become hostile. Banks is recruited to help the US military decode the alien's communications. On a deeper level the film invites an exploration of our understanding of time as the aliens offer the chance to see it in a non-linear way. At the beginning of the film, Banks talks to her daughter saying "I used to think this was the beginning of your story. Memory is a strange thing. It doesn't work like I thought it did. We are so bound by time, by its order." This sows the seeds and things are set for a film that to all intents and purposes proceeds along a linear timeline, but as Banks understands more and more of the alien's language, so she is subject to flash-backs - or are they premonitions? This film messes with time and the viewer's perception of it. What if time doesn't really sequence one thing after another but is in itself non-linear and multidimensional? In addition to exploring time as a concept, the film 'coincidentally' invites a reflection on giving and receiving love, and human identity in the vastness of the universe. The editing of the film is completely at one with the story and the way in which it is told. Jump-cuts slash back and forth across time to emphasise the non-linear nature of the alien's understanding of it. There is also a clever play on dark and light, shadows and smoke - the almost mirror-like environment within the alien's spacecraft. The subtle use of colour shifts to underscore what different characters are doing and where the film is heading also reinforces the story and through that, viewer engagement. I've tried not to give the plot away as that would spoil things. The acting is strong in this film - not only from Adams but from the others too. 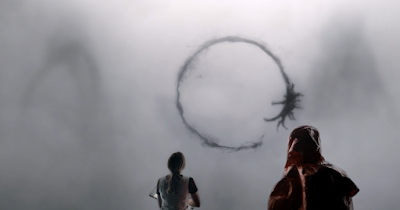 It makes a refreshing change to have an alien movie that is not simply a shoot-em-up but invites another way of exploring extra-terrestrial encounter. Louise Banks appears to me to be extremely intuitive. That causes me a problem as intuition is my shadow side and therefore difficult for me to connect with. This is not a the run-of-the-mill sci-fi alien encounter film. The storytelling, acting and expansive ideas carried by a script that is both challenging and believable all combine to deliver a gift of a film. Do seek it out if you've not seen it. It will repay the investment of time. I'll give it 8/10.